The object I chose is a fringed scarf that I hand made about five years ago. The scarf is about five feet long including the length of the fringe. In width the scarf spans 30 stitches across. The material is 100% acrylic yarn of two different colors. A majority of the scarf is beige with 4 rows of orange at the end to add an accent color. At one end the orange stripe is detaching because of a missed stitch. 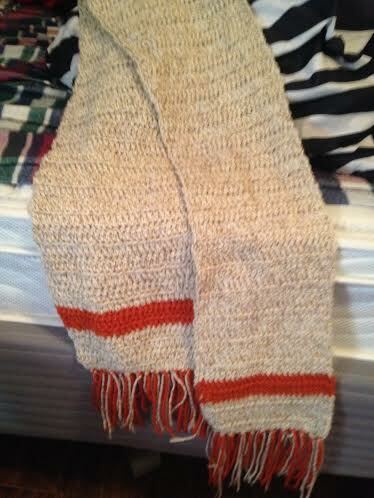 These orange and beige colors are also the colors used in the fringe at each end of the scarf. I crocheted the scarf myself over the course of about 3 weeks. Despite its simplistic materials and physical appearance, the handcrafted nature of the object makes it something special. All of the work and time that went into crafting this gift gives it more meaning than if I had simply purchased a scarf. Five years ago I lost my grandfather to pancreatic cancer, but more importantly, my grandmother lost the love of her life. Since they were married the only time they were ever apart was during the hours that he had to work. Every morning she would stand on the front steps and wave goodbye to him as he drove away. The day he passed away was the last day she every waved him goodbye. Obviously, the next birthday would be difficult for her because he would not be by her side. So I decided to make something that would give her a bit of comfort. That’s how the scarf came into existence. The small stripe of orange at the bottom was my grandfather’s favorite color, which incorporated a little piece of him into the scarf. I made her and my father matching scarves that they both opened during their shared birthday party. I still am not sure whether she was more excited about the memory of him in the scarf or the fact that her son that shares his name had a matching one. At the beginning of this month the scarf came back into my possession. With all six of her children surrounding her, my grandmother was reunited with the love of her life on December 26, 2014. She was one of the more amazing women that I’ve been lucky to have in my life. Although the nurses in intensive care continuously said that she was the lucky woman to have six children and twelve grandchildren with her as she passed. Both sides were lucky to have each other, which is why the scarf became something more than a scarf when my father handed it to me earlier this month. Not only does this simple article of clothing continues to connect me to both my grandfather and my grandmother, but it also connects me to my father who owns the only other one in existence. This scarf symbolizes my family itself in a way because without their lives there would be none of us, without their love we would not be here today. Finally, this scarf reminds me of what kind of person I want to be. Both of my grandparents put everyone else before themselves, cared for everyone in their community as if they were family and loved unconditionally. That’s the kind of life I want to live. That’s what this scarf reminds me to do every day I look at it and wear it. That’s what gives this object value. 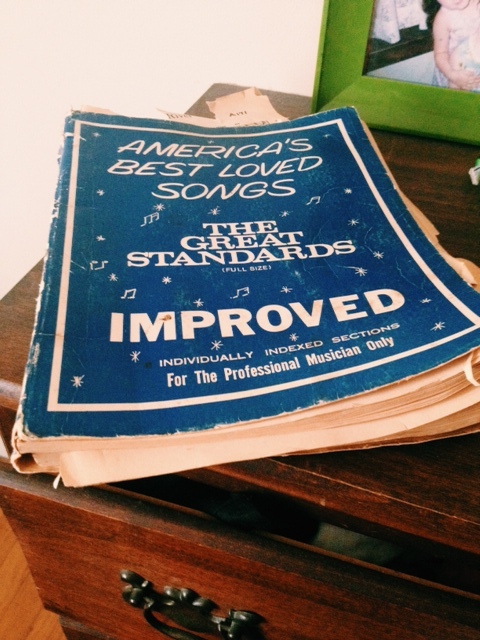 The tattered pages of my Grandfather’s music book hold some of America’s best loved songs from the time. The blue facade, although covered in veins of old age, is decorated in tiny notes and stars, that surround the title. “America’s Best Loved Songs: The Great Standards” in a range of soft to more serious fonts. The bottom reads”For the Professional Musician Only”. From the front you can see pages sticking out, as they’ve fallen from the comfort of the spine. Ripped and bent edges stick out like overgrown vines. Once the book is opened , you can flip from”unchained melody” to “fools rush in” with relative ease. And, although as the title suggests it is a rather “standard” book of music, it has much greater meaning for me. 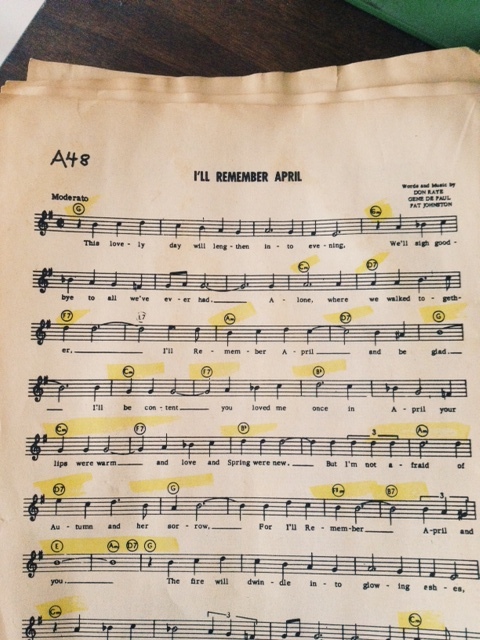 Each rough, yellowed page, is a symbol of something my Grandfather used to play. His hasty highlighting through the measures remind me, that this book, like many other collections of music, are living, breathing documents. They can be altered, in one way or another to fit the need or taste of the musician who is playing it. That maybe the most significant thing about this book to me. I’m not only able to play songs my Grandfather played, I’m able to play them how he would. And, as I flipped through until the very end, looking at the title “Mazl”, a song I’m unfamiliar with, I let the book fall forward, to a close. And, on the back, I see, what can undoubtedly, especially knowing my Grandfather, be a coffee stain. And to me, that just made the book all the better. The necklace with the thin silver chain, that has the quarter sized coin hanging from it, and the gold frame , has a history, much longer than it’s chain. Found by the scuba diver/treasure hunter Mel Fischer off the coast of Florida, the Atocha coins were once on Spanish galleon ships, long before they were found on the bottom of the ocean floor. One, side has a large cross engraved in it, with a cloud like frame around that. On the other side, there is what looks like a coat of arms, some parts covered in engravings of castles and lions, while other parts are just adorned with horizontal lines here and there. On the far right of the arms reads the letters, “POD”. What it stands for, I’m not sure. Notably a weird thing to wear everyday, this coin not only reminds me of how cool I thought the treasurer hunter and his loot was, but of my family. As we each have a coin of our own that we wear. For the most part, the coin reminds me of my dad, who has been scuba diving since he was 18 years old. The man would love to get lost in the lull of the ocean, any time, any day. It reminds me of all the times he took me out to go snorkeling. I would always follow him as he harpooned eight feet down, to get a closer look at a fish or shell. And, now that I’m beginning the process of getting my own scuba diving license, I look at the coin as helping lead up to all that. It’s been with me since I was probably twelve years old, and by then I, much like my dad, was very happy staying among the salty waves. And now, 21, graduating college and hopefully doing something enjoyable with the coming years, perhaps it’s a symbol of some adventure to come. On the ocean floor, or bobbing above them. 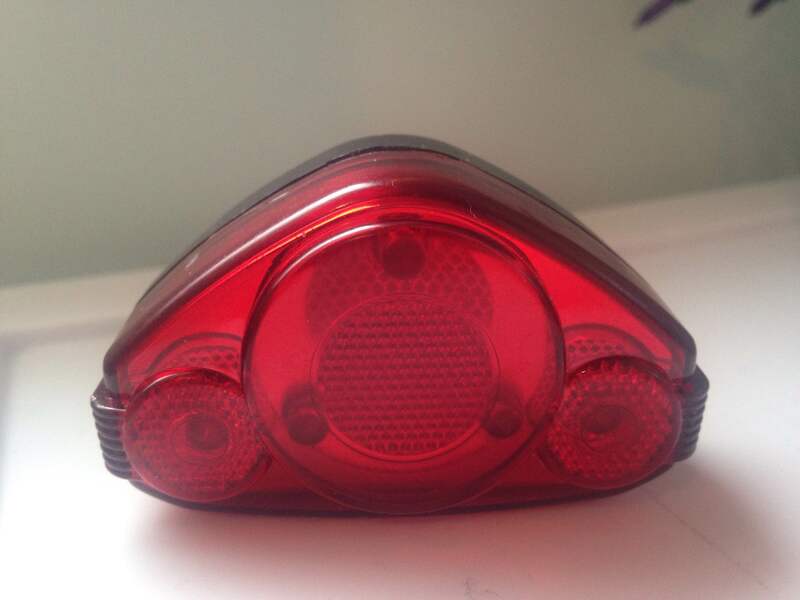 Found on the rail trail behind my apartment, this bike light doesn’t necessarily seem like an object the typical person would stop to pick up. Almost in perfect condition, the bike light is pretty unscathed for something that was nestled in the dirt and probably had quite the fall from a moving person’s belt while they were cycling. 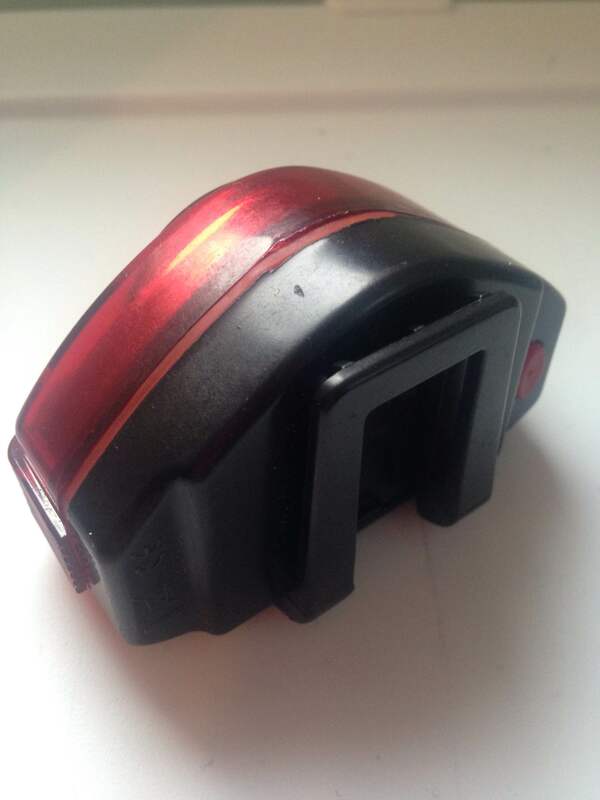 This object is bright candy apple red and black, and about 2 inches in width, 1 inch in height. It must have fallen off of someone pretty recently before I snatched it up and maybe they even had bought it recently, because the light works quite well. Okay, so whenever I find things and decide on keeping them I feel a twinge of guilt. Yet it also reminds me of geocaching (a fun pastime: defined as an outdoor recreational activity, in which participants use a GPS or mobile device and other navigational techniques to hide and seek containers, called “geocaches” or “caches”, anywhere in the world) and adventure, like finding buried treasure (even if this item was not exactly hidden) and hey, if I saw the person who actually dropped it, I would definitely have gave it back to them! Moving on, the reason why I kept this object: it is memento for another set of objects that always hold dearly to my heart: bicycles! It took me a while to learn how to ride. My dad taught me in the parking lot of the school across the street from my childhood house and it took me until the ripe age of 10 to finally get the hang of it without the training wheels. Before learning, my parents forced me into their bike escapades by putting me onto this contraption which turned my dad’s bike practically into a tricycle. Prior to that, I would sit in a little trailer, which I adored because it was like a mini moving tent. They even found ways to bring our dogs on the bike rides. Now my father is almost 60 and handicapped and somehow, miraculously, the man can still ride a bicycle even though he can barely walk. This mode of transportation is extremely important to me because at the age of 20, I still don’t have a driver’s license, but for the past 10 years I’ve enjoyed pedaling myself to places I would like to go and feeling the wind in my hair. It’s exhilarating and feels rewarding when you reach your destination. To me, a bicycle is a magical object. 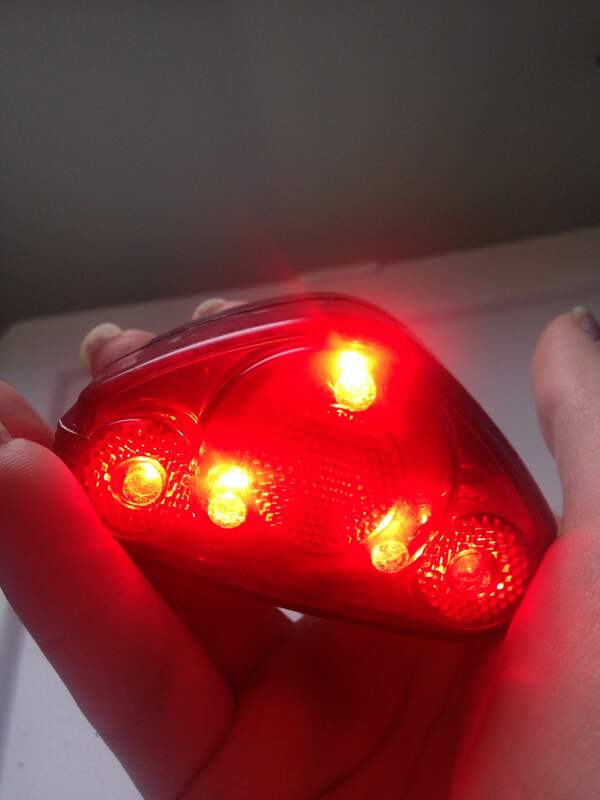 My parents have taken their bikes up to New Paltz to ride on the very trail I found this light on. I’m thinking of giving my dad the light for his birthday so he can put it to good use. The sterling silver bracelet that now sits on the table in front of me is also twenty years old, but it does not remember the world like I do. I’ve worn it no more than a dozen times (primarily weddings, funerals, and church events) and yet it remains as one of the most important pieces of my life-story. The single silver chain, the spine of the bracelet if you will, is just about six inches long, and dips about one inch below my wrist when each end is clasped together. Branching off of that delicate spine are twenty-four, unevenly spaced, silver charms. Each charm (one for every year I’ve been alive, and four extra for ‘milestones’) tells a different story, some of which I remember, and others that have been passed down to me by my mother via the image on the charm. Looking first at the tiny clasp on the left end of the chain, and moving sequentially to the open hook eye on the right side, you’ll see a small purse, with one semi-circular strap and four rows of tiny inlaid diamonds. Then a 2-dimensional heart with the words “Sweet 16” cut out in the middle, followed by a 2-D “2000”. After that there is a racing bike, a musical eighth note, a hollow trolley with tiny red lettering on the top of the car that reads “San Francisco”, and a Scottish terrier standing alert with his shorthair tail sticking straight up. Next, a graduation cap with the tassel switched over to the right side and the year “2012” right below the brim, a track shoe with four miniature spikes on the bottom of the sole, and right next to it a different pair of shoes; two baby booties, each with a single small pearl at the end (as if they were capped by fuzz-balls). Once again there is a 2-D heart, except this one is solid silver all the way through and has my initials carved in beautiful curving script, “CCR”. Sitting directly three inches down the spine and taking the place of charm #12 is my favorite of them all; the “Happy Birthday” cake, decorated with icing all around its perimeter, and a hinge on the back which used to allow me to open the top of the cake. In the bottom of the hollow cake there was a tiny golden candle standing straight up. From what I remember, it had a spiral design going all the way up to the top, where there was a little golden flame waiting to be wished upon and blown out. Next to the cake is a solid silver soccer ball, the Eiffel tower, a catholic cross, a 2-D laptop that says “You’ve Got Mail,”a two-person canoe, a ballerina in a tutu with her toes pointed in fifth position, a round medallion with a dog’s paw-print engraved on the surface, and a school bus that labels itself (just in case we didn’t recognize its iconic shape). Finally reaching the last inch of the spine, there is a nameless book with the number “12” engraved on the back, a ‘traditional’ artist’s pallet with a few specks of green and yellow paint left on the surface, a golden retriever (also standing alert, although his tail is much more relaxed than the terrier’s), and last but not least a simple 2-D scalloped shell. According to my mother, each one of these charms is representative of a certain time or event in my life. She chose them every year, from the same jewelry store, to be given to me as a gift on the same day each April. The delicate silver chain was a timeline of my life, and every charm she purchased to adorn it has been a reminder of my accomplishments. On the 22nd of April, I would open the white & silver striped box from the jeweler and spend about five minutes turning the charm over and over in my hand, getting to know it’s beveled edges and thanking my mother for buying it. But as soon as I would set it down, she would take it back and tell me that she would bring the charm and the bracelet back to the jeweler so that they could be joined. I always watched as she slid the spine back into a plastic bag and dropped the charm in before she sealed it shut. I wouldn’t see it again until it came out of that bag the same time a year later. Truthfully, this bracelet and each one of these purposely ‘special’ charms are nothing more than a reminder of how differently my mom and I remember the story of my life. I do not remember ever liking Scottish terriers, or having any sort of party for my sixteenth birthday, or being allowed to use the family computer, let alone have an email account. I was downright terrible at singing, and my dad and I almost drowned on that canoe-trip that she chose not to go on. I do remember, however, that I absolutely despised catholic church school as a child, and that I only ran track when I was thirteen because my mom told me I needed to get more exercise, and that my absolute favorite charm (the birthday cake) was glued shut when I tried to open it on my tenth birthday because she “didn’t want me to break the candle”. I do remember trying to build memories with my mom that were heavier than this silver bracelet, and trying for years to prove to her that I was responsible enough to chose my own charm. But for right now, I look at the bracelet for inspiration; it is a reminder to stand up straight, with a spine that was not designed by anyone else and to fill in the rest of my timeline with charms and accomplishments that are important to me. Maybe it was it’s delicacy that appealed to me. I saw the elaborately decorated, hollowed out egg trinkets sitting on the shelves of a small shop and I decided I wanted one. I was about six, I wasn’t serious, and I stated my desire under the pretense that it wasn’t going to happen. My sister gave it to me for my birthday. It’s a small, light pink egg on a skinny gold stand. It’s barley over two inches tall. All the exposed egg shell has been painted pink and glittered. The stand’s base is flat and rounded with swirling impressions on it like an ancient coin. The actual column of the stand tapers at the top and is impressed with a swirling pattern. At the top the stand, little gold leaves form a small bowl for the egg to sit. The egg has been cut in half in a sort of curved diagonal, and the two pieces are hinged together. Small pearl beads and gold rope line the edges where the egg has been cut. There is also a larger pearl in the center of the top edge, creating the impression of button. The egg is topped with a circle of small pearls surrounding a clear gem in a gold, crown like setting. Designing the egg to open must have been an expression of the crafter’s skill, since it can hardly hold anything, not even a nickel. Nonetheless, the inside has been elegantly lined with polyester, waiting to cushion absolutely nothing. Though I rarely took the egg out of its case, it still sustained some damage. A small piece of the shell cracked off, forming a hole in the back of the shell, near the base on the right. I was playing with the egg while it was in the case thinking if it dropped, nothing would happen. I was wrong. This event convinced me to keep the egg in the box and out of sight. Probably years have gone by between openings. Mostly what I see of the egg everyday is its navy blue box. Stickers on the front of the box read “Kingspoint Designs,” and its item number. On the top is another sticker, roughed around the edges, with instructions on how to take the egg out of the box. I’ve taken the egg out without following the directions and it’s just the same. When I told my mother that I was enrolled in a class studying the role of objects in shaping both our personal lives and our cultural heritage, she immediately offered to dig up as many family mementos as possible. One of the several items that she excitedly passed along to me on a recent visit is a ticket stub, dated September 6, 1931, for an event at the Plaza de Toros in San Sebastian, Spain. It was likely purchased by my great grandparents (my mother’s father’s parents), Stella and Emilio de Jauregui-Blanco, while they were living in France. Just shy of three inches long and two and half wide (for those who prefer exact measurements, the dimensions are 2” by 2”), the ticket stub is no bigger than a gum wrapper and just as thin. It appears to be printed on paper. Yet, despite its thinness, this paper is surprising strong. When given a gentle tug, the ticket does not rip as one would expect, but springs back, not unlike a dollar bill. It is possible, that, like dollar bills, the paper is combined with cotton or linen, making it more resilient to wear and tear as well as better able to absorb and retain ink during the printing process. Indeed, it is the printing on the ticket that transforms it from a mere scrap of paper (a gum wrapper to be tossed away) into a cultural artifact signifying not only a purchase but also a presence. One side of the ticket features an incredibly detailed tri-color print of a man mounted on a white horse trying to evade the rush of a muscular grey bull. The horse’s eyes have been blindfolded with a red bandana and, if you look quite closely, the bull’s shoulder is shaded with a little bit of red, imbuing the scene with a palpable tension. At the top of the scene, a dramatic font proclaims in shades of yellow “Plaza de Toros.” I am tempted to imagine that the ticket is for a bullfight not unlike the one depicted, but nothing else on the ticket directly suggests this. The only clue to the circumstances of the event appears in the red margins that border the scene. To the left of the bullfighter, and running perpendicular to the scene, are the words de beneficencia, “of charity,” suggesting that perhaps this was a charity event of some kind. However, the beginning of the phrase, which might have revealed the beneficiaries of this charity at least, has been ripped off, possibly by a ticket collector as my great grandparents made their way into the Plaza. The reverse side of the ticket appears to be an advertisement for shops (almacenes) in the area. The red italic script in the lower half of the stub promise fabrics (tejidos), silk/screenprinting (sederia), and leather goods (peleteria) at the best prices (a los mejores precios ). It is interesting to imagine whether or not my great grandparents paid any attention to this advertisement, choosing perhaps to go to the address listed in bold red letters (the first half has been ripped off, leaving me lost, unable to trace it exactly) to buy trinkets for their son, my grandfather, who would still have been quite young at the time and not ready to attend a potentially dusty, crowded event at the Plaza. Emilio de Jauregui-Blanco, a citizen of El Salvador, would eventually move his family back across the Atlantic, finally settling in Guatemala. Moving is a daunting process under any circumstances, and I can only imagine that a transatlantic move would be especially so, requiring the family to choose what they absolutely would not part with and what could stay behind in Europe. Somehow, this little ticket stub made the cut, successfully traversing both the ocean and three generations to make it into my hand. Certainly, it has little or no monetary value, nor will it ever grant me access to an event in the Plaza. However, what it does have to offer is far more meaningful. It offers me a physical link to my great grandparents. And, while I cannot say for sure what exactly they did on September 6, 1931, I can tell you it was significant. I have the ticket to prove it. This ring’s home is around the index finger of my right hand, though for the longest time it had been worn around that hand’s middle finger. It is a size 7 and when taken off, the shape of the ring is circular, despite its slightly irregular shape, likely due to wear. I was given this ring nine years ago, nearly to the day, (my birthday was on Friday!) when I turned 13. 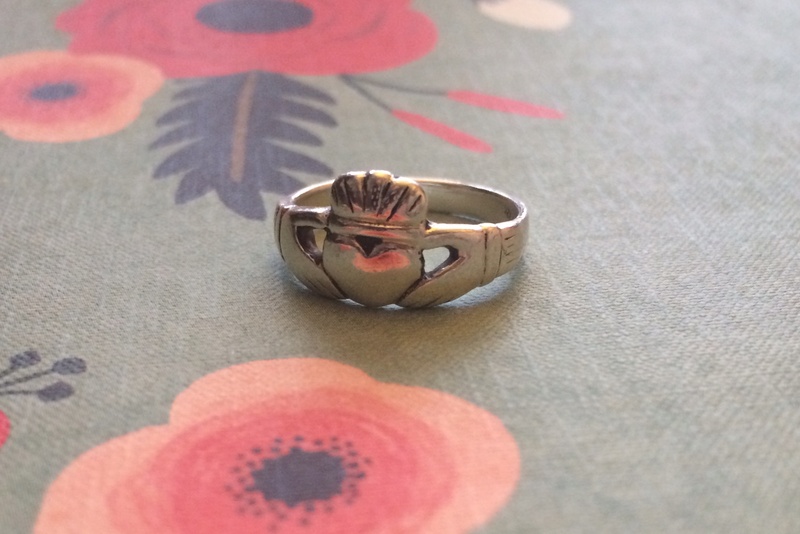 My grandmother gave me this ring as it represents our Irish heritage, it being a traditional claddagh ring. The ring is made of silver and is very simple in design compared to the plethora of claddagh rings I have seen since owning it, now that I am aware of their commonplace in not only Irish culture but American culture as well. 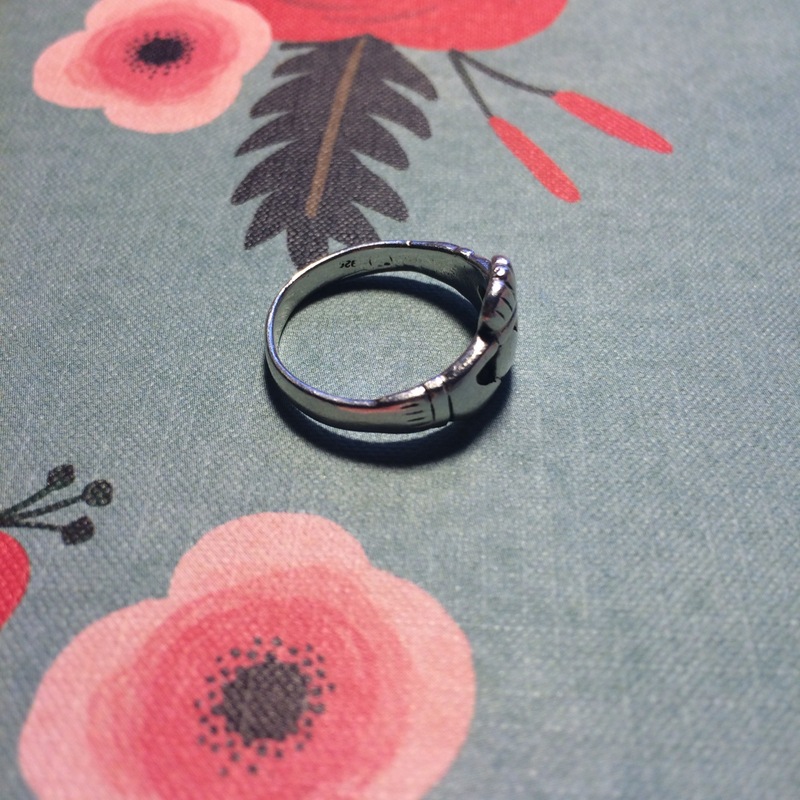 As mentioned before, the ring is ever so slightly bent, perhaps from wear over nine years of ownership and my own personal mistreatment of the gift, me being at times an irresponsible owner. 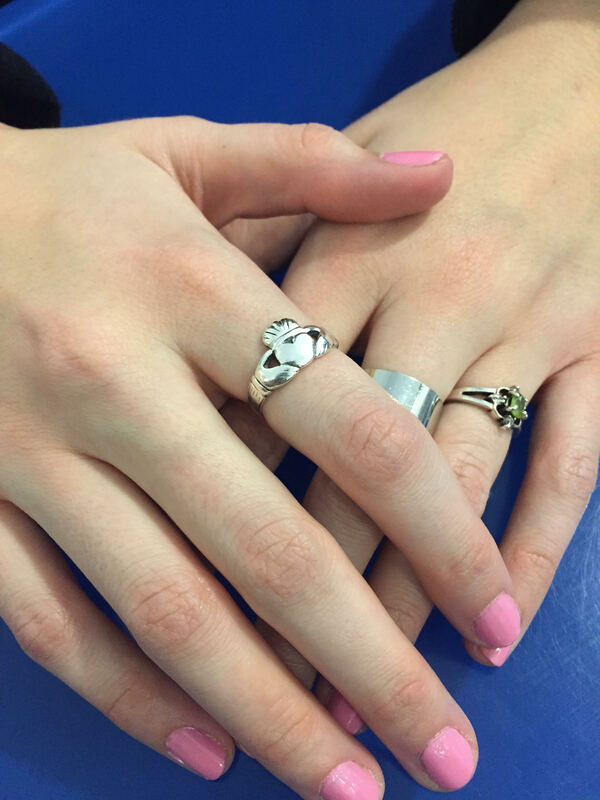 The focal point of the ring is the iconography that makes it specifically a claddagh ring. The band forms two hands that come together from either side to hold a heart that wears a crown. This ring is very modest in its design compared to an array of ornate variations that can be found. The hands that clasp the heart appear as though they stem from a wrist clothed in a shirt—there is a line that appears vertically across the silver band to emulate a shirt cuff accompanied by horizontal lines—almost like faint scratch marks now that have worn down significantly—to look like the folds of the cuff. The hands are positioned such that the thumbs are holding the heart from above while the rest of the fingers are drawn together below the heart with an open space between the thumb and fingers. There are faint markings to mimic the separation of the individual fingers though they appear haphazardly and are not evenly distributed to create all the fingers. These lines too are faint, requiring close inspection. The heart itself is somewhat oblong, favoring a more horizontal shape with rounded edges rather than a strong vertical, pointed heart shape. Between the heart and the crown there is a space but it is not completely open unlike the space between the thumb and the fingers. Rather, it appears as a cavity within the metal. The crown that sits atop the heart has a simple band with the top of the crown marked by seven lines to show the arches. All these pieces come together to make the claddagh, representing friendship, love and loyalty characterized by the hands, heart and crown respectively. The ring’s diameter is 2 centimeters, the backside of the band is .3 cm and it is 1 cm from the base of the heart to the top of the crown. The outer, backside of the band, the side not on display while worn, is regular in width and without detail. When inspected closely, the outer band is laden with imperfections. Faint scratches, none that actually cut away at the silver but just scratch the surface are detected, likely from constant wear of the ring and coming in contact with other objects that would disturb the metal. The inside of the band has a scratch or marking of some kind on the right side when observing the ring with the front facing forward. On the left side of the inner band, there is a faint marking that appears to be numbers that have significantly worn away likely due to constant wear. The numbers appear to read “325” which leads me to believe they signify a serial number for the make of this style ring. There are other minor markings, perhaps scratches or imperfections in the making of the ring that are found on the inner band, close to the printed number. 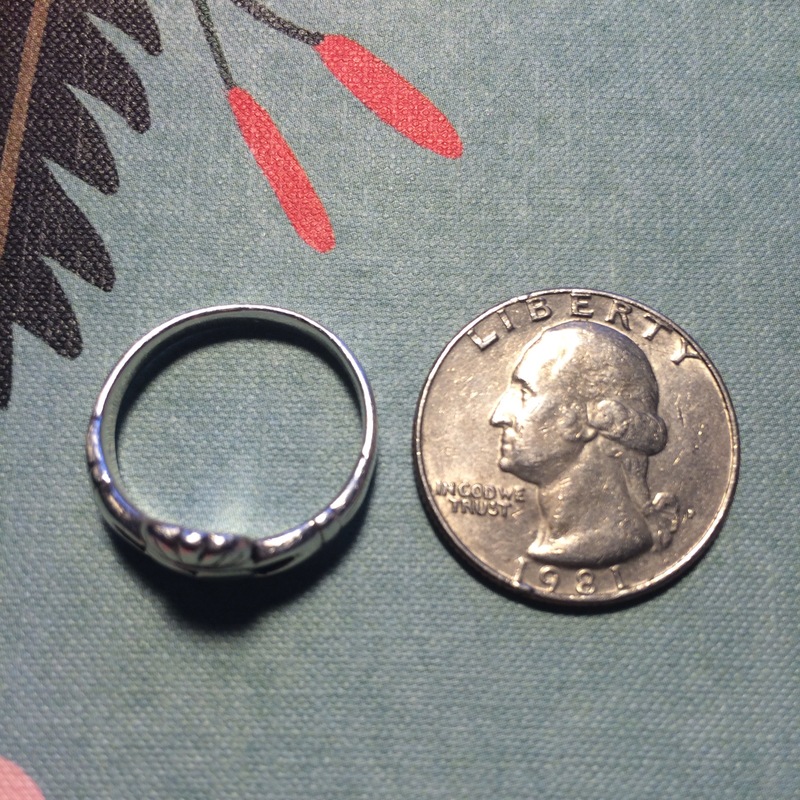 I’d like to determine what type of material the ring is made out of since it has been susceptible to scratches and markings over time and has tarnished little over nine years. I know that it is a very common style ring as I’ve seen them all over gift shops and specialty stores both in the states and in Ireland. Despite it being so common, I’m excited to look into the history of the claddagh symbol and how it grew so feverishly in popularity over time. Having traveled to Ireland and visited the city where the design originated, I’m eager to learn about the possible customs and traditions associated with the ring and how its usage has changed over time. 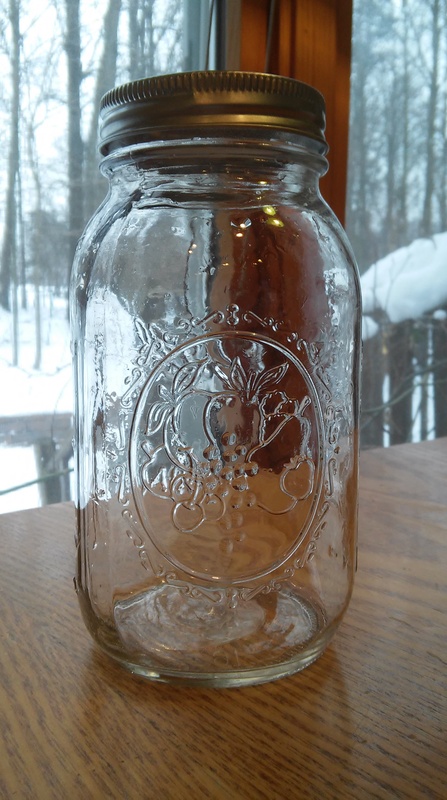 Although Ball Mason jars seem relatively plain, this one packs a lot of personal meaning through its purpose. It is, however, used universally for canning and preserving, and Ball jars have been around since 1884. Soon after, they became a household item. 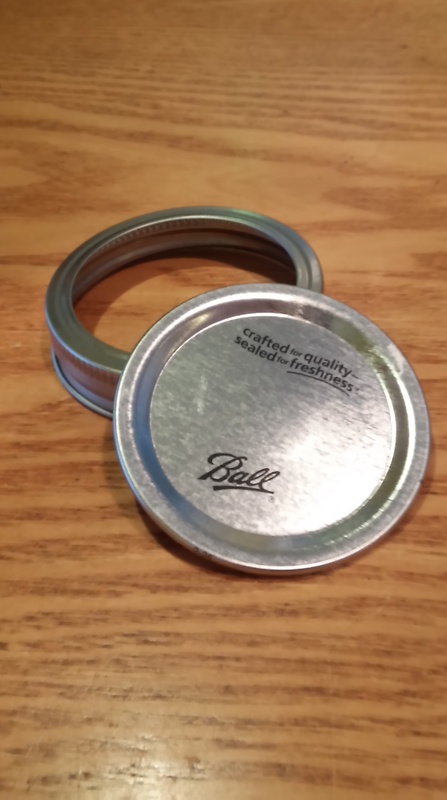 Although all Ball canning jars are glass, they come in many sizes and styles, some have jellied finishes, some the “plain” design, size ranges from 4 ounces to 64 ounces, mouths can be wide or regular, lids metal or plastic. The Ball canning process has diversified itself. My jar exudes simplicity – it is the standard quart size, regular mouth, metal canning lid, with a plain finish. Plain, in this case, means that the glass was made with an easy measuring system in both metric and standard. For the standard measurements, every four ounces are denoted by a horizontal line which is one inch long and every eight ounces is denoted by its numeric value in addition to the line. The ounces are displayed on the right, and the left displays the number of cups. Thus, I find this jar to be ideal for any person who spends a lot of time in the kitchen, saving someone time in the cleaning of measuring cups. The jar stands seven inches tall and three and a half inches wide. The mouth of the jar is two and three quarter inches. The lid is made of two pieces. The sealing component is metal and sits on top of the mouth of the jar. The band twists over the seal and acts to securely close the jar. 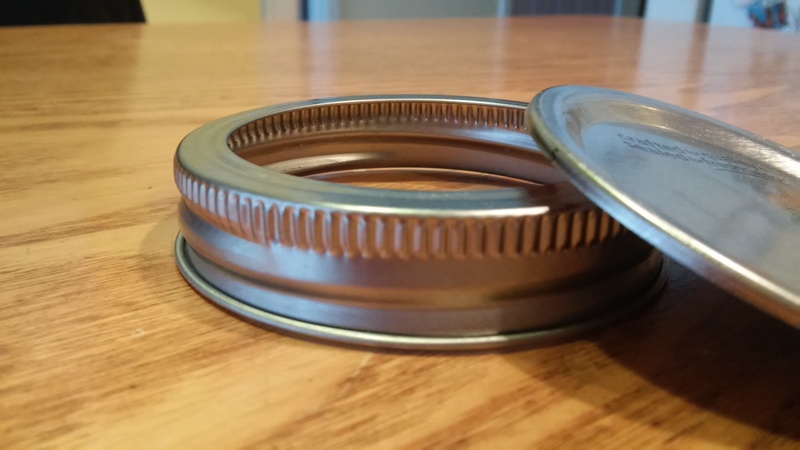 Both of the lid components are dependent on the other to properly seal the jar so that the contents stay fresh. The band of the lid has ridges along the top portion which are visible on the inside and outside of the band. On the inside, it acts to properly seal. On the outside, it adds a bit of character to the lid and also serves as an ideal place for particles to reside, making the cleaning process less than pleasurable. The “plain” finish has an elaborate design of a variety of fruit (pear, apple, cherries, and plum – which is disproportionately larger than the other pieces of fruit) enclosed in an oval which has an olive branch border. The design on this portion of the jar is evokes a taste of Tuscan living, and a culture in which food and making your own food is both common and a treasured way of life. The design alludes to the main purpose of the jar: practicality in the kitchen. Despite the (what I find) appealing appearance of the design of the fruits, the jar holds a practical purpose – namely, keeping food fresh. My family has traditionally used this style of jar for making cracked Sicilian olives, and it is containing an nominal amount of said olives that the jar entered my home. In addition to the nostalgic feeling it evokes of my family canning activities, it is also an icon of my present activities. Over the past year or so, the jar returned from retirement and has traversed many miles since its first arrival to my home some five to ten years ago. 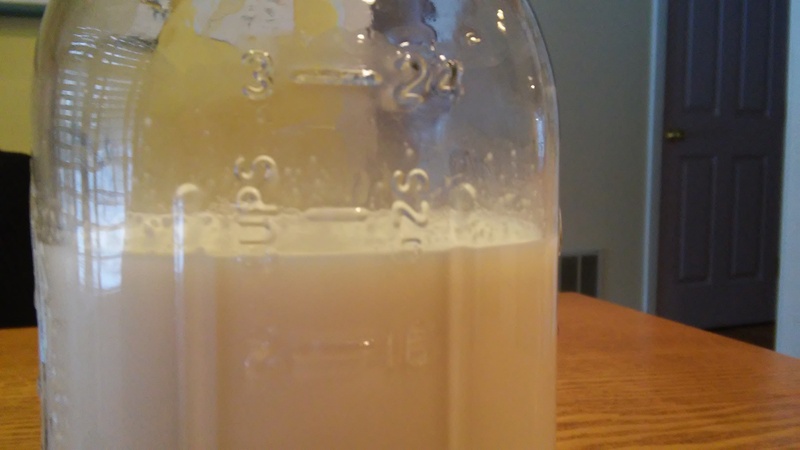 Almost weekly, the jar accompanies me to work (a goat dairy) where it is then filled with fresh milk. The Ball Mason jar is iconic at the farm, although quart sized aren’t as popular as the half gallon in more recent months. 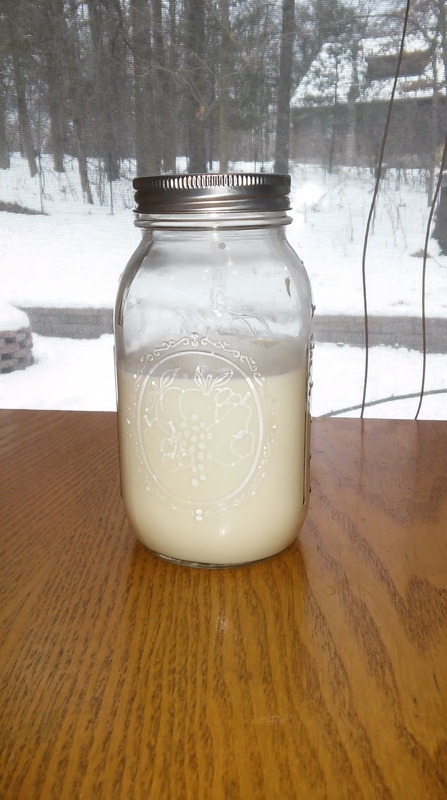 Since the milk is raw, a canning jar is quite ideal for retaining freshness, especially when using the metal lids and bands instead of plastic lids. Additionally, the material of both the jar and the lid (glass and metal, respectively), appeal to people concerned with their carbon footprint and amount of waste they dispose of. Being able to reuse the jar, even from one purpose to another, like canning to storing, saves both money and resources. I believe this attribute appeals to people who are more prone to like simple and back-to-basic items. Therefore, the design, or one could possibly argue the lack thereof, also serves as a marketing tool to people of a certain mindset. 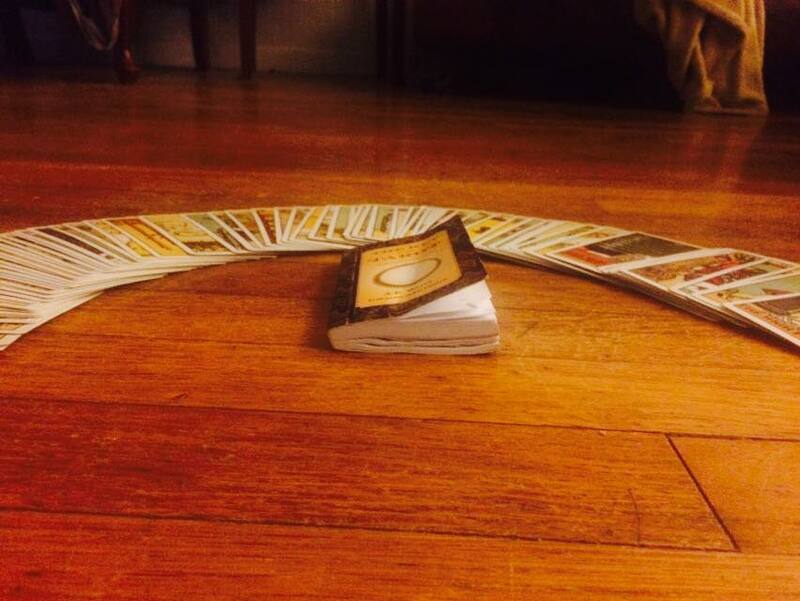 My Rider Waite tarot pack travels from location to location within my house. I have had a few decks before this one, but so far it is my favorite. Although I have been interested in tarot since my younger years, it is not until recently that I’ve begun to study them more seriously. The tarot pack comes with a book entitled The Key to the Tarot which was written by A.E White at the time of its creation in 1910. I am still a novice, and like those whose cards I read, each image holds new mystery and discovery. The Ta rot cards are flat and rectangular in shape. Like traditional playing cards they are made from layering paper, creating a product called pasteboard that is then used to print the cards (madehow.com). On the back of each card is a cerulean blue and white design of roses and tulips. The cards themselves are 5” by 2.5”. As you can tell, the size of a deck makes it very portable. 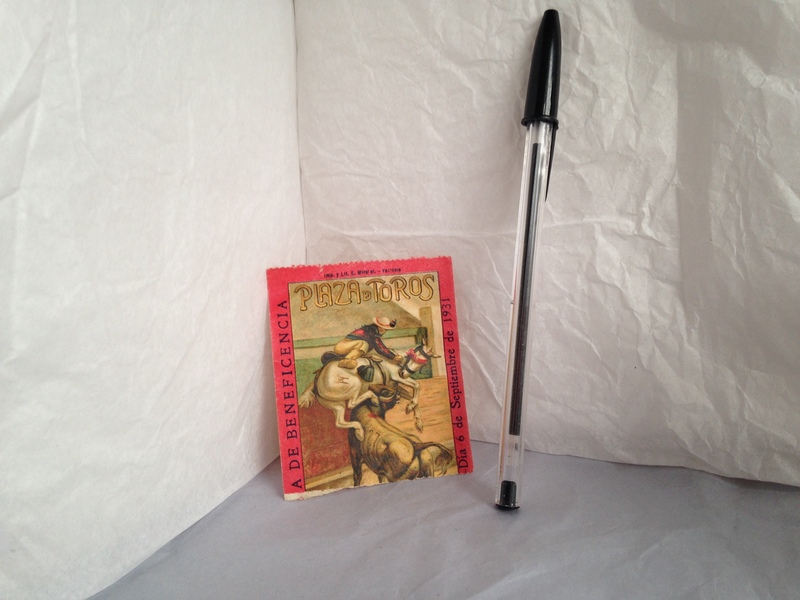 The accompanying book is the same length with a width of half an inch. The cover of the book is deep blue with gold mimicking the design on the cards with an inner rectangle displaying the title and author. Also within this rectangle is the ouroboros, a snake eating its own tail, which is a symbol for eternity. The pages have experienced slight water damage, but are still legible. 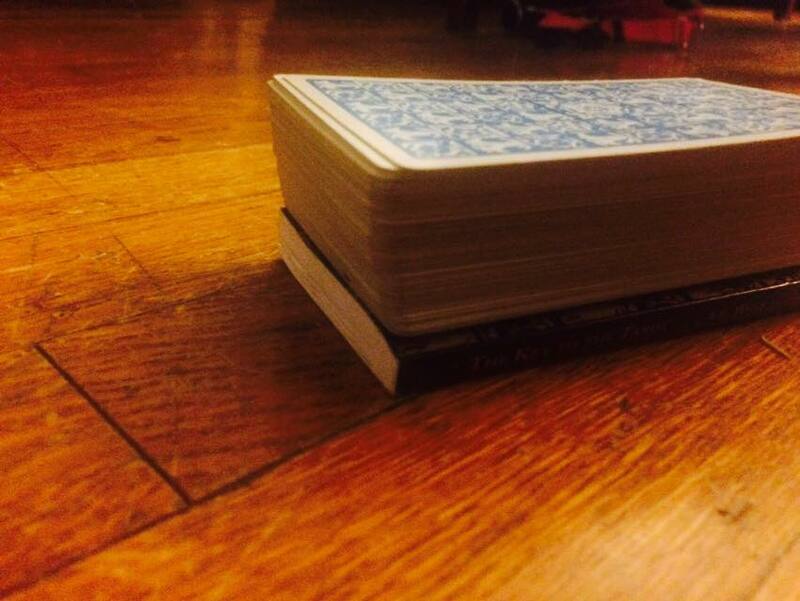 The tarot consists of a 78-card deck. These cards are broken up into two groups: The Major Arcana and the Lesser Arcana. The Major Arcana is made up of 21 trump cards numbered with roman numerals. There is another card in this part of the deck that has no number, but is usually assigned the number zero; this is The Fool. The image of The Fool is represented by a fair young man precariously close to a cliff. Behind him, a dog scurries at his heels but it is unclear whether the dog means to harm the man or warn him of the imminent danger. In his left hand is a white rose and in his right he carries all his worldly belongings. The back drop is yellow with a white sun. In the Lesser Arcana there are 56 suit cards. Suit cards, similar to a traditional playing deck, are part of 4 different groups consisting of fourteen cards each. These are: Wands, Cups, Swords and Pentacles; each of these suits has their own King, Queen, Knight and Page. On the front of each card is a depiction of a particular scene which conveys the situation at hand and the emotions associated with it. Each suit has its own element and connotations. For Instance, the suit of wands is typically associated with the element of fire and spirituality. 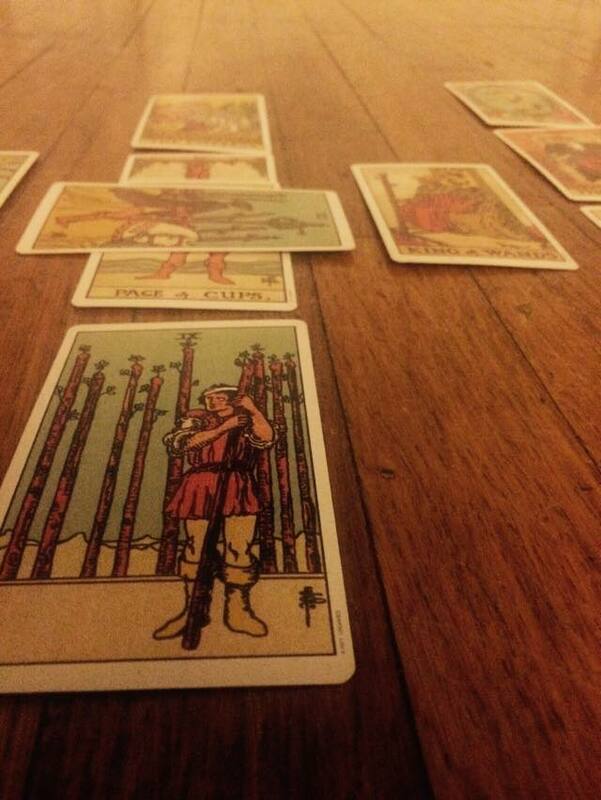 Let’s look at The Nine of Wands, which is represented by a man preparing a battlement. He looks distressed as he holds one staff in his hands and looks on at the other eight which he has positioned to block out enemies. Without The Key to The Tarot, one may conclude that this card signifies strength in the face of opposition on their own. However, not all cards are as straight forward as they seem and for this reason the book is essential for full understanding. Waite also provides instruction on how to position the cards in the traditional Celtic cross method at the back of the book. The purpose of a tarot reading is the quest for divinatory truth by the “Querent”, who is the person the cards are being read for. In the time that this tarot was first devised very few people would have owned their own set. The history of the tarot extends before the creation of the printing press. Before then, each image would have been painted on the front of the card by hand (Eden 3). The world has grown smaller since then. A doctrine that Waite says in theory has always existed (Waite 53) is now accessible to the masses for the low price of $20.49 on Amazon.com. My interest in these cards is not a belief in any real ability for them to predict the future, but in the archetypes and symbols that each card represents, which I find both fascinating and elusive. I do believe most people whose cards I read create their own interpretation of the images. This speaks to the human psyche’s relationship with materials and symbols. Since the dawn of man we have sought to assign meaning to life and all of its treasures and disasters. The tarot cards create a tangible representation of that continuous search. “Playing Cards.” Madehow. Advameg Inc., 2015. Web. 25 January. 2015. Waite, A.E. The Key to The Tarot. London: Rider Books, 1910. Print. Gray, Eden. A complete Guide to the Tarot. New York: Bantam Books, 1970. Print. The object I chose for this particular project is my grandmother’s cross necklace, as I find it the most intriguing. The necklace is made of a hard, sturdy, silver-colored metal. Since it hasn’t tarnished at all since my grandmother owned it (and is just a touch darker than any silver jewelry I’ve seen) , I’m doubtful of its being made of pure silver; perhaps a silver alloy or steel is the more likely composition. The cross pendant measures roughly 2 1/4 inches high and 1 1/4 inches across, and it sports a design of slanted hatch marks reaching upward/downward from the center and overlaid by a much thinner, smoother cross. Deeper, more noticeable hatches are visible at somewhat regular intervals along the branches of the cross–eight in total on each of the three short branches and 23 on the long branch. Each branch of the main cross ends in a slight flare, and v-shaped notches that meet the ends of the small top cross are cut out of the centers of each one. 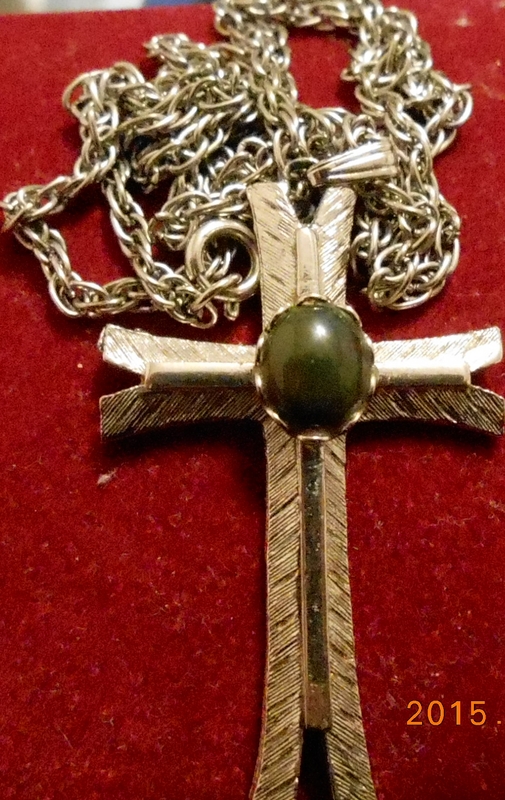 In the middle of the piece, where the branches of the cross are connected, is a smooth, opaque oval stone, forest green in color except for some tiny flecks of red here and there, and encased in a setting made of little silver arches. 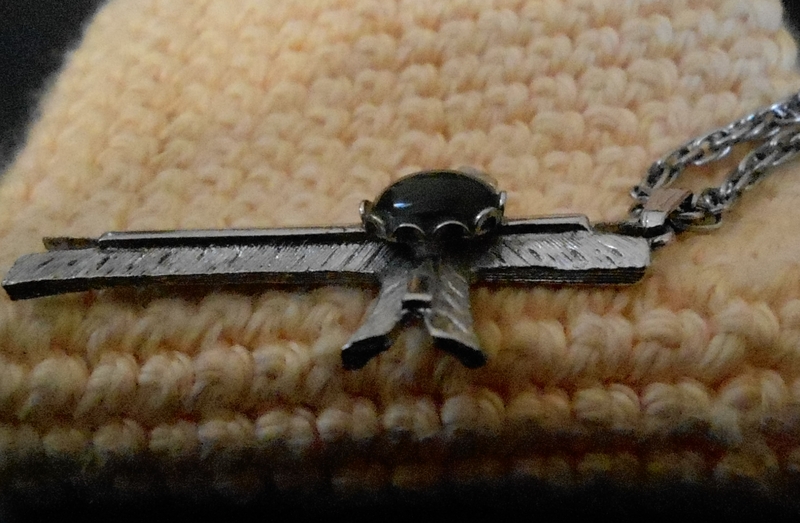 This setting does not hold the stone in place; rather, it looks as if the stone is attached to the piece with some kind of glue or clear jewelry cement. The chain attached to the cross is actually two smaller chains linked together so that the individual links stagger, giving it a “stacked” look. The cross pendant and chain are connected by a thin, triple folded metal band serving as a decorative jump ring. When I wear it, it reaches to about mid-chest length. This necklace was given to me when my grandmother died (I was in the third grade at the time), but in the hustle and bustle of dealing with the aftermath of her death, I never thought to ask anybody how it had found its way into my grandmother’s possession. About a year ago, I approached my aunt–who was very close with my grandmother–and asked her if she knew anything about it. She didn’t even remember having ever seen it. Curiously, this piece lacks any markings, stampings, or other identifying marks displaying its country of origin, its material composition, or the name of its manufacturer. Given that most commercially-produced items have been marked in this fashion for some time–our family even has a few heirlooms dating back to my grandfather’s infancy that are stamped with the factory of origin–I found this to be a bit strange. Image searches on the necklace and general research about jewelry makers in upstate NY (where my grandparents lived) turned up no results. 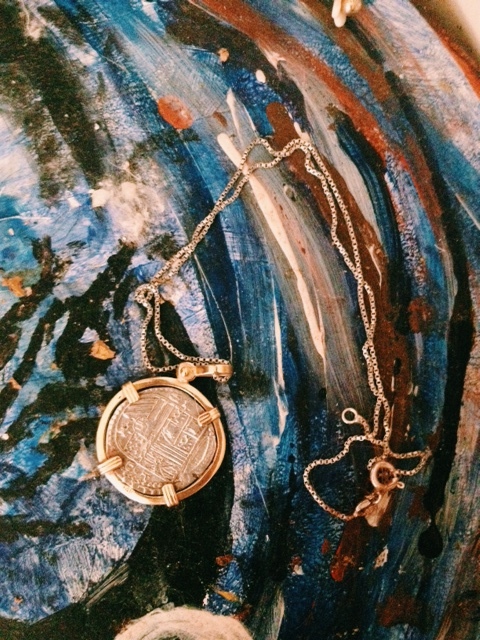 I’m considering taking it to a jeweler to gain some insight into when and how the piece was made, but regardless of how much or how little I discover about its history, it will always be a significant symbol to me as it connects me to a side of my family I know very little about.